Stems 1--3 mm diam. Leaves whorled, recurved, 10--40 ´ 1.5--4.5 mm. Staminate spathes 2--4-flowered, 7.5--12 mm; pedicel to 80 mm. 2n = 46. Flowers summer--fall. Shallow waters of lakes and streams; introduced; 0--500 m; introduced; Ala., Ark., Calif., Colo., Del., Fla., Ga., Ill., Ind., Kans., Ky., La., Md., Mass., Miss., Mo., N.J., N.Mex., N.Y., N.C, Okla., Oreg., Pa., S.C., Tenn., Tex., Vt., Va., W.Va.; Mexico; West Indies; Central America; native, South America; Europe; Africa; Asia; Australia. 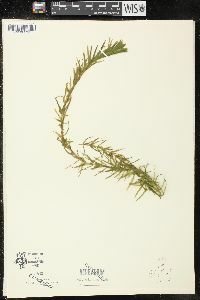 Egeria densa is native to southeastern Brazil and has been widely sold in the aquarium trade, often becoming established in nature. Only staminate plants of E. densa have been observed outside its native range. Reproduction, then, occurs entirely by vegetative methods. No differentiated vegetative reproductive structures (turions, bulbils, etc.) are known (C. D. K. Cook and K. Urmi-König 1984b); however, the species is known to live temporarily under ice. 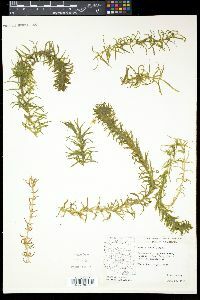 The leaves of Egeria densa, which are only two cell-layers thick, are much used to demonstrate plant-cell structure and cytoplasmic streaming in introductory botany courses. 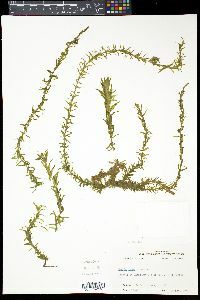 Perennial aquatic herb to 0.6 m long (rarely to 6 m) Stem: submersed, rooted in substrate or free-floating, highly branched near water surface, bright green, usually 30 cm to 0.6 m long (rarely to 6 m long), 1 - 3 mm across. Leaves: stalkless, in whorls of four to eight, bright green, 1.2 - 4 cm long, 1.5 - 5 mm wide, oblong to linear with a blunt to rounded tip, very finely toothed, recurved, with short internodes. Flowers: either male or female, found on different plants (dioecious), petals much longer than sepals, brought to surface of water on stalk-like floral tube formed by joining the lower parts of the sepals, petals, and stamens (hypanthium). Two to four male flowers arise from a leaflike sheath (spathe) 1.1 - 1.3 cm long and deeply cleft along one side, with each flower 7.5 - 12 mm across and having 3 - 4 mm sepals, 9 - 11 mm petals, nine stamens, distinct filaments, and linear anthers. Female flowers rising about 2.5 cm above the water surface, smaller than male flowers, with three white petals, a deeply three-cleft style with each segment two-or three-cleft, and a single-chambered ovary. Female plants do not appear to exist in the United States. Fruit: a smooth egg-shaped capsule, opening irregularly, containing spindle-shaped and mucilaginous seeds. 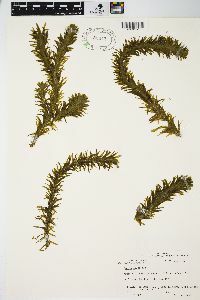 Similar species: Elodea canadensis and Elodea nuttallii are distinguished from Egeria densa by having leaves in whorls of three and tiny or no petals. 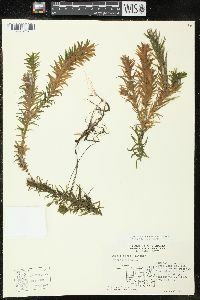 Habitat and ecology: Introduced from South America for use in aquariums, this species is uncommon in the Chicago Region. It has become common in the Southeast where it grows in shallow and slow moving water of rivers, streams, springs, ponds, lakes, and ditches. Notes: This species was introduced from Brazil, Argentina, and Uruguay for use in aquariums and water gardens. It is able to form large colonies that compete with native plant species, decrease fish and water fowl populations, and support mosquito breeding. Female plants do not exist in the United States, so seeds are not produced. However, the species spreads by fragmentation, usually by the actions of birds or boats. Etymology: Egeria is named after a Roman goddess or nymph and adviser to Numa Pompilius, a Roman king. Densa means dense.